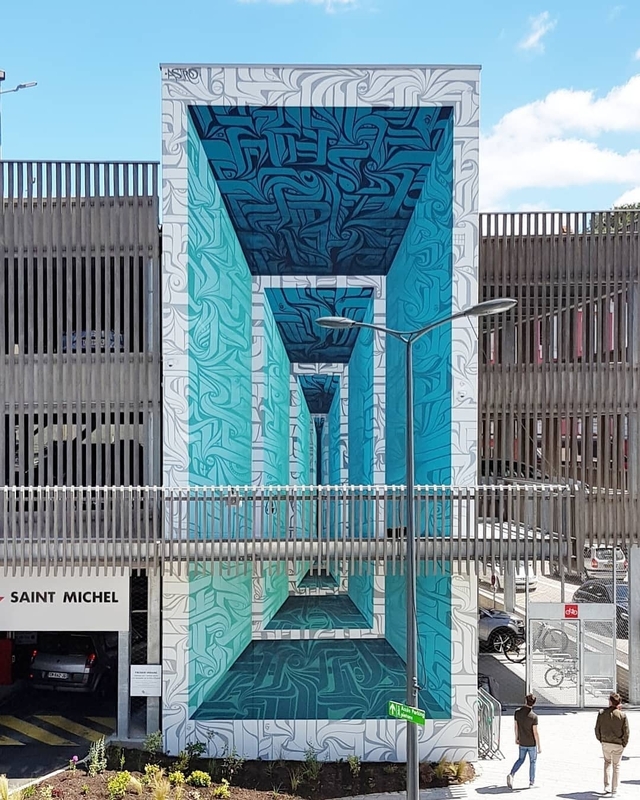 Epinal, France: new anamorphic piece by French artist Astro ODV for Galerie Mathgoth. Epinal is a town in Eastern France. It is the largest of the Vosges (34,000 inhabitants). It is known worldwide thanks to its imagery which exists since 1796 and which was one of the first to produce images in series. Art has an important place in this small town, especially in the public space. There were already urban art frescoes by local artists. This time, the authorities wanted an artist with an international reputation. This is why they asked Mathilde and Gautier Jourdain, the founders of the Mathgoth gallery in Paris. Mathgoth gallery is specialized in the creation of large murals. The French artist ASTRO was chosen, with his great optical illusion. The artist needed a short week to complete his fresco on the wall of a car park in the heart of the city.